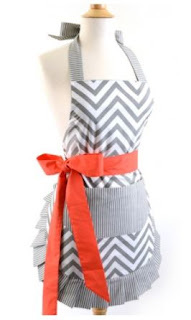 What a great price on this Women's Original Chevron Coral Bow Apron $13.99 (Retail $34.95). Bake delicious sweets while being trendy at the same time with Flirty Aprons' Original Chevron Coral Bow apron! With neat pleats lining the apron's edge, a light grey chevron design and a pop of coral, this bakers apron is perfect for women of all ages. Our durable, double-layered baking aprons are 100% cotton, giving you the comfort and flexibility you need when checking on those baked goods. Each grey chevron apron is adjustable, allowing you to accentuate your best features. This coral chevron apron is sure to please!